The book offers meditations not just on matters of cooking and eating, but extends to sleep, dreams, exhaustion, and even death. 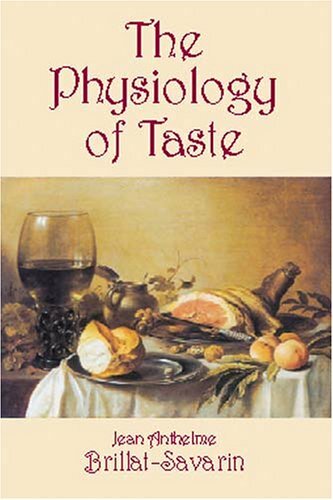 Brillat-Savarin, whose genius is in the examination and discussion of food, cooking, and eating, proclaims that the discovery of a new dish does more for human happiness than the discovery of a star. Ever have the urge to monkey around in the kitchen? Then look in here for primate-proof directions to some popular favorites. Of course you can do it! This is a book on cooking for complete beginners, containing cooking techniques and tips. Mom's collection Volume II contains the 250 best recipes from their cooking blog: cakes, cheesecakes, brownies and cupcakes, pies, icings, frostings, fudge and candies, breads, entrees, side dishes, puddings, cookies and cookie bars, beverages, etc. The Cook's Decameron: A Study In Taste is a book about the life in Italy, the cooking style and the recipes. The author describes very interesting details about life in the old days in Italy. Containing over two hundred recipes for Italian dishes. by Catherine Owen - Cassell, Petter, Galpin and Co. Although this is not a cookery book, insomuch as it does not deal chiefly with recipes, I shall yet give a few; but only when they are better than those in general use, or good things little known, or belong to the domain of a French chef.